Two weeks ago, we at Thinkergy launched our brand-new, upgraded TIPS online test platform. And two weeks ago, I also shared with you the first 6 out of 12 actions that you can take as an individual after you’ve been TIPSed. So what other actions should you take after you’ve completed the TIPS profiling test and received your report with your test result? Because every TIPS profile has certain assets, they should also focus on producing tangible outputs that relate to their strengths. (An earlier article in this blog titled How to boost work productivity and performance with TIPS discusses on this topic in greater detail). Page 24 of the profiling reports notes how you can contribute value to your organization and what target outputs you can easily produce. For example, while I as an Ideator can come up with more new creations and ideas than a Partner, they easily outperform me at building and nurturing relationships and closing deals. So, how can you add value with your profile? And what target outputs should you focus on at work? In an earlier article in this blog titled Does your talent fit your work environment?, I shared with you how each TIPS profile thrives in certain ecosystems where its easy for someone with a particular profile to perform in harmony with their natural talents, interests and styles. In this connection, an “ecosystem” may be an industry (such as banking or consulting), a business function (such as accounting or sales), or an organizational type (such as start-up venture or a non-government organization (NGO)). 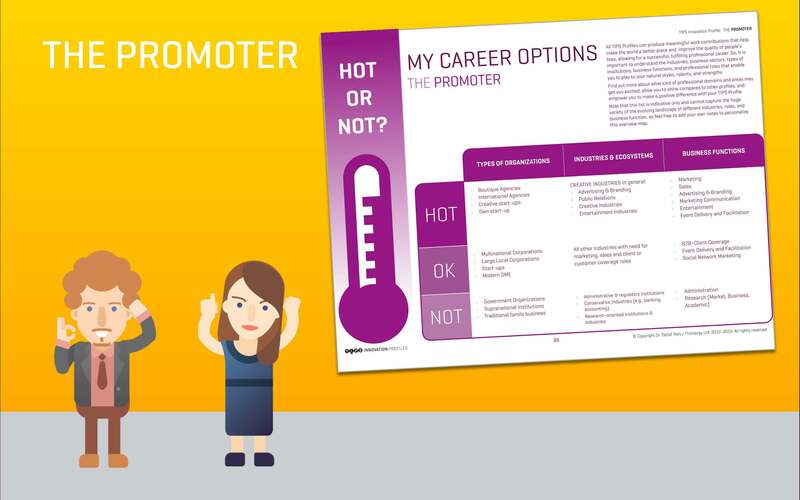 The section “My career options: Hot or not?” (on page 26 of your TIPS profiling report) outlines what ecosystems fit to your TIPS profile (“hot”), which ones are “OK”, and which ones are best avoided (“not”). For example, for a Promoter, the creative industries and certain market-related business functions such as Marketing, Public Relations & Communications are “hot”, while a Promoter is best not aiming for a career in accounting, a law firm or a government agency. So, what are “hot” —and “not”— environments for your TIPS profile? After you’ve gained more clarity about your profile’s home base, styles, life metaphor, assets and liabilities, target output focus, and hot environments, it’s time for you to make a game plan on how to best align your unique talents with your work and career. To help you in doing this, page 26 of your TIPS report contains a list of guiding questions that support you in creating a career game plan. Go through these questions one by one alone, or together with a friend or buddy, or —even better— with a certified TIPS coach. Capture your answers to the questions, then devise a game plan for your career that, among other things, may include certain learning and development initiatives and strategic job moves to align your profile to the right environment and set you up for sustainable career success. One way to shortcut your learnings is to learn from the best. Hence, TIPS offers you a collection of role models who exemplify the mindsets and styles of each TIPS profile. Consider reading biographies of these famous leaders, or immerse yourself otherwise in documentaries, videos, or articles that tell you more about their success strategies. It’s highly likely that getting into the heads of top achievers with the same profile type can give you further ideas that you may adopt or adapt into your career game plan. What leaders and top achievers do you admire? Are they listed as role models of your profile? An earlier blog article titled “What is your innovation style?” detailed out how the various TIPS profiles also differ in their preferred style to innovate. Some profiles clearly embrace a more adaptive innovation approach, others clearly enjoy pursuing a more disruptively innovative style, and some profiles feel at ease with either of these two directions. Your style to innovate also reflects if you’d rather work alone, or prefer to work together with others in a team, or if you can flexibly and easily switch between solo-work and teamwork. Page 26 of your TIPS profiling report informs you about the typical style to innovate of your TIPS profile. For example, as an Ideator, I am a Solo-Team Innovator, meaning that I feel equally comfortable both working alone on an innovation project or in the middle of a team, for as long as the project pushes for bold, radical change. So, what’s your style to innovate according to your TIPS profile? 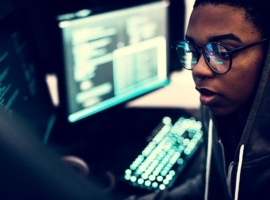 Some TIPS profiles lead or work on innovation initiatives from the front, while others excel at “managing” or administering the innovation system from behind. (I explained the differences in an earlier blog article titled Creative Leaders and Innovation Managers: Same same but different). Page 31 of the TIPS report outlines in general how you may best contribute to corporate innovation with your profile. In an innovation project, each profile performs well at certain stages of the innovation process. Using the example of X-IDEA (Thinkergy’s awards-winning innovation method), page 32 of your TIPS report outlines the stages (and related thinking tools) that you tend to enjoy most. 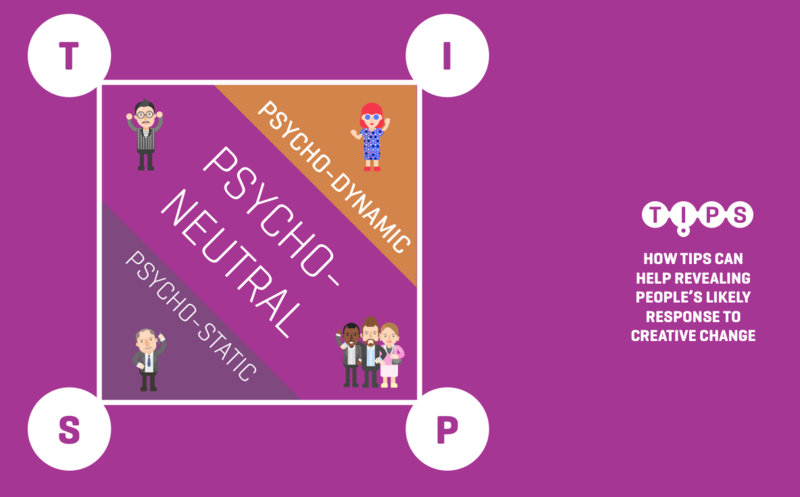 Depending on your TIPS profiles, your mind can be described as more psycho-dynamic, or more psycho-static, or somewhere in between (psycho-neutral). This distinction reveals if you have the potential to be developed into a creative leader to lead innovation initiatives of your organization, or if you’re better advised managing efficiencies, processes and systems at the backend (see page 33 of your TIPS report). Finally, your TIPS profile also describes how you tend to respond to creative change initiatives, and whether you’re a change pioneer, agent, skeptic, laggard, or resister (page 34 of the report). So, looking at your TIPS profile, how can you best contribute to corporate innovation? Next article Who shines when in the creative process?